On Tuesday, 23 June 2009 the celebration of the traditional John fire will tace place in San Miniato, in the province of Pisa. The romantic festival will be completed with dances, songs, and traditional tastings from the region. Every year, on the evening of June 23th, the fire of St. John burns on the lawn of the fortress Federiciana. The festival begins with the distribution of paper lanterns with candles inside to adults and children in order to light the way from the city up to the tower Federico II. It is for both adults and children an extremely romantic and cheerful event, which will surely remain in permanent memory. San Miniato is a town with 27,979 inhabitants in the province of Pisa. The historical center is located in a strategic position on a hill along the Arno river, between Florence and Pisa. During the Middle Ages, San Miniato was a permanent scene of bloody clashes between both cities until the final conquest by Florence. 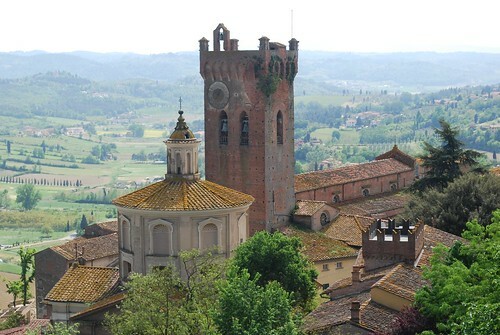 Today San Miniato is a major center of the leather processing and world famous for its white truffles. The province of Pisa and the Pisan hills are very reminiscent of the Chianti region: rolling hills, slender cypress trees, vineyards and olive groves, together with cultural masterpieces by painters, poets and architects. For those who want to enter into this wonderland we offer a magnificent cultural program. For accommodation we suggest one of our comfortable, rustic apartments on traditional wineries.